Research has indicated that in recent years social media has penetrated almost all types of organizations. Higher education institutions have not been left behind too and have been adopters of this global phenomenon. Social media takes many forms such as social networking sites, blogs, vlogs, instant messaging and virtual communities. Having said that, the social networking site Facebook appears to clearly emerge as a winner predominantly because of its large number of members. Facebook allows its members to create and share content, build relationships and enable collaboration and connectivity irrespective of geographical location. The rapid rise of social media provides numerous possibilities for higher education institutions to adopt it to further their learning and teaching endeavors. The ubiquity and unusually high uptake of social media makes it suitable for administrators, managers, learners and teachers in higher education institutions too. For learning and teaching, social media is used in a variety of different contexts - language learning, writing development, after-class discussion, synchronous and asynchronous communication, community building and curricular tool. The use of social media in higher education is changing the nature of the relationships of learners and teachers. Social media provides a unique stage for interaction amongst students and teachers and amongst students themselves. Through social media, students find it easy as well as convenient to communicate, access information, and to provide information. Studies have shown that in the recent years academics have been expanding their social media usage to offer after-hours support for students, deliver and host lectures, disseminate information and engage in discussion. The use of social media has also demonstrated increased teacher-student and student-student interaction. With social media, students also become adept at the use of online technologies in learning environments. Studies have indicated that the use of social media in higher education has enhanced learning, increased participation and engagement, improved content dissemination and improved pedagogy and information sharing. Apart from the use of social media for learning and teaching, it is also being used for creating awareness and advertising. Social media enables educational institutions to provide stakeholders with information about new research programs, changes to policies, events, job vacancies, alumni engagement and institutional news. Some colleges and universities also use social media as a tool for recruiting students. Social media provides a perfect platform to highlight new courses, research and teaching staff and campus facilities in an attempt to attract more students. However, the use of social media in higher education is not without some inherent limitations. Its limitations include technological and privacy concerns, dominance of academics, passive behavior of students and absence of academic language usage. And to add to this list is the lack of awareness of the functionality offered by the social media platform. As everyone uses social media differently, academics need to be aware of the different approaches to the use of social media in formulating the integration of social media for their learning and teaching activities. The creation of Facebook groups is recommended to circumvent privacy concerns, encouragement to passive students is suggested and adequate training should be provided. Training and guidance should be delivered not just to students but to staff too. In summary, social media continues to transform pedagogy and can be used to support learning and teaching activities that were traditionally confined to classrooms. The use of social media in higher education presents many challenges but its importance cannot be ignored.Research has established that a majority of academics are of the perception that social media may be employed successfully in supporting the provision of student-centered learning approach. With the usage of social media, students no longer continue to remain passive absorbers of knowledge but become co-producers and contributors. In the current educational environment, learning has become more of a social process and the use of social media strengthens that process.The use of social media, like in many other areas, is here to stay in higher education settings too. What needs to be worked out is how higher education institutions globally continue to embrace social media to their own benefit. 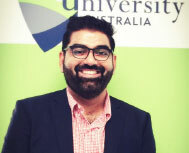 Dr. Ritesh is a senior lecturer in the School of Engineering & Technology at the Melbourne campus of Central Queensland University, Australia.He teaches to both undergraduate and graduate students in the fields of Information Systems (IS) Management, Process Analysis and Design, and IS Project Management. Ritesh is an enthusiastic and committed educationalist who has been awarded several academic and teaching awards to recognize his teaching excellence, commitment to improved student outcomes and engagement in reflective learning and teaching activities. His research interests include social media, knowledge management and information systems management.